Although a chain drive garage door opener can be a little noisy in operation and some feel it’s more demanding of maintenance than belt or screw drive openers, there is really not that much that can go wrong. If you lubricate the chain every now and again, this type of opener will serve you well for many years. At some point though, the sprocket which engages with the chain to raise and lower the door may need replacing. If the chain on your door opener begins to skip or jump when the door is being raised, it’s a sign that the teeth on the sprocket have worn. Fortunately, replacing the sprocket, which is located at the top of the motor, is an easy enough DIY task. Here is a simple, step-by–step guide to explain the process. 1) Pull down on the manual release cord which disengages the drive trolley from the chain arm. Now you can lower the door manually. 2) After lowering the door, use a stepladder to climb up and disconnectthe power supply to your garage door opener. Do this by unplugging the power cable from the ceiling outlet. 3) You will find a snap on cover where the chain engages with the sprocket atop the motor. Use a screwdriver to remove the cover. 4) Now relocate your stepladder to the end of the chain arm nearest to the garage door. You will see a chain pulley on the top of the chain arm. Loosen the bolts on the pulley and slide it just an inch towards the motor. 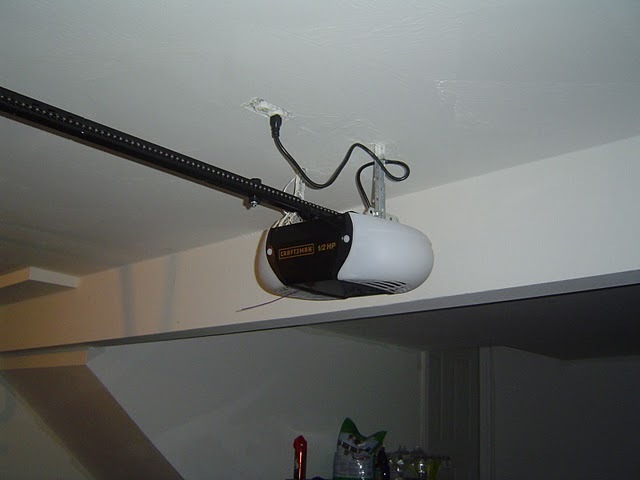 5) Move your stepladder back to the motor of your garage door opener. Using a ratchet and socket, undo the machine bolts which hold the sprocket in place and remove them. Save the bolts. 6) Use your screwdriver to pry up the sprocket and then remove it from the motor. Take the chain from the sprocket and lay it over the chain arm. 7) Now use your socket and ratchet and the bolts you saved to install the new sprocket. Fit the chain around the sprocket. 8) Return your stepladder to the end of the chain arm. Climb up and slide the pulley towards the end of the chain arm until the chain is tight, then slide it back toward the motor just enough so the chain touches the top of the chain arm. Now you can tighten the bolts that hold the pulley in place. 9) Now reposition your stepladder to access the motor one last time. Fasten the sprocket cover back in place and plug in the power to the garage door opener. 10) Return to the floor and pull the manual release cord to refit the trolley to the chain arm, putting your door opener back into automatic mode. Now you should find you can raise your door using the opener without the chain jumping. If replacing the sprocket doesn’t cure the problem or you simply prefer not to tackle this task yourself, you can always call on your local garage door installation and repair service to resolve the problem instead. Installed in pairs, so you can work in your garage with just one door open if you want. Simple mechanism, so all you have to maintain is the hinges and the door finish. A good solution if you use your garage as a workshop or store for items other than a car. Not well-suited to use with an automatic opener. Less secure than vertically opening garage door types. Wide range of designs and finishes available – You can even have windows in a sectional door. You can park your car very close to the door and still be able to open and close it. Quiet and smooth in operation. Can be used with an automatic opener. The only potential drawback of a sectional door is that horizontal tracks are required and the door takes up ceiling space in the garage. Roller design is the most space-saving of all garage door types. No swing-out, so cars can be parked close to the door without impeding its operation. Roller doors are normally insulated and have good thermal qualities. Roller doors open and close smoothly and quietly. Can be used with automatic door openers. The variety of decorative designs for roller doors is limited, since the nature of construction dictates a horizontal format. Roller doors can also be quite expensive compared with other door types. Well balanced design makes this type of door easy to open and close manually. When opened, the door protrudes from the door opening to afford a degree of shelter. Usually the most inexpensive of the garage door types. Manual opening and closing only. The door swings out when opened, so cars must be parked to allow sufficient space. Quieter in operation than canopy style doors, especially when used with an automatic opener. Retractable up-and-over doors take up more space internally and externally than other types. Fairly complex mechanism means more can potentially go wrong. 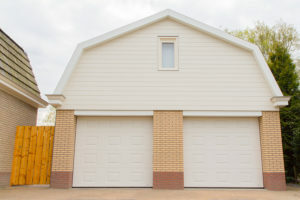 While this breakdown of pros and cons should help you decide which of the garage door types is best for you, it’s always a good idea to try and see examples of each type in operation before you buy. Eventually the hinges or rollers on your garage door will need replacing as a result of wear and tear. Very occasionally your door might become derailed from its track, in which case the displaced roller/s will need to be relocated. In either case, replacing a roller or a hinge is a relatively straightforward DIY task. The only exception to this is if the bottom rollers or hinges need replacing. Never attempt to replace a bottom roller or hinge yourself as they are installed under tension – That’s strictly a job for the professionals. The process is pretty much the same whether you are replacing the garage door hinges or the rollers, the only difference being the part that you replace. To safely carry out the replacement task though, there are some important preparation steps you should take for safety and to make the task easier. Garage doors are very heavy, especially if constructed from wood. 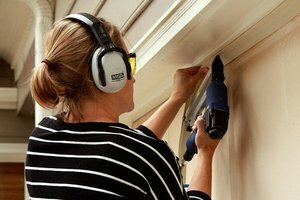 Working on any heavy object can be dangerous, so it’s important to take effective safety measures before and during any garage door DIY work. It’s also important to remember that garage door springs are under tension most of the time. Don’t attempt to disconnect the springs on your door. If you use the correct approach to replacing rollers and hinges, there should be no need for the springs to be removed or tampered with. The most sensible way to work on hinges and rollers is with the door to your garage in the “up” position. While this does mean you need to use a ladder and work at height, the spring tension is at a minimum when the door is up, making the task generally safer. Start by raising the door to the open position using the automatic opener, then disconnecting the power supply to the door opener. By disconnecting the power, you will ensure nobody accidentally lowers the door while you are working on it. If you don’t have an automatic door opener, just raise the door manually before starting work. As a further safeguard, it’s a good idea to install a C-clamp on the track at either side of the door, just below the bottommost roller. The two C-clamps act as stops, ensuring that the door can’t descend. When you remove garage door hinges with the door raised, the door is in a horizontal position parallel to your garage ceiling. This means the door panels will sag when you remove the hinges which keep them in the horizontal tracks. Therefore you need to use some form of prop to support the panels. If you don’t support them, the panels may break. One way to support a panel is by clamping two wooden boards together to create a prop of the right height. Now that you have secured your garage door in the raised position, disconnected the door opener and supported the panels which you will work on, you can go ahead and replace any worn hinges and rollers. The actual replacement takes only a few minutes per hinge and you’ll soon be enjoying a cup of coffee and contemplating a job well done. Perhaps the most popular mechanism for an automatic garage door opener is the belt drive. Belt driven openers are a little more expensive than chain or screw drives, but they are also quieter. They also don’t need a lot of maintenance to keep them going for at least seven to ten years. The only thing you need to do with a belt-driven opener is to adjust the belt occasionally. This is a very simple job to do yourself – In fact all you need to do is follow this simple 6-step guide. All you need to get started is a step ladder, a 7/16 inch wrench and a flat head screwdriver. Close the door using the automatic door opener and secure it. Double check that it’s properly closed and let everyone at home know you will be working on the door (so nobody attempts to open it while you are adjusting the belt). You should find the power outlet for the door opener mounted on the ceiling. Use the step ladder to reach it and unplug the power lead to the opener. You will now need to move the step ladder to gain access to the point where the opener trolley meets and connects with the opening rail. Typically the trolley will be made up of two parts: an inner and an outer trolley. The belt connects to the inner trolley. Be careful not to damage the trolley rail while setting up the ladder. The drive belt is linked to the end of a threaded shaft which in turn connects to the master link chain. This threaded shaft is affixed to the trolley by a screw spring with a nut ring in the center. Twist the screw spring in a clockwise direction to press the trolley stop against the spring. 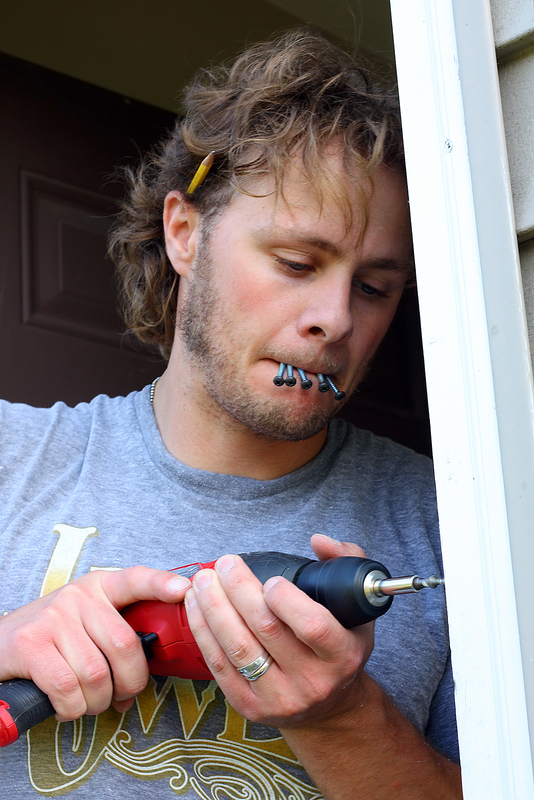 In order to tighten the screw spring, you need to pull the threaded shaft in the direction of the garage door while simultaneously using your free hand to tighten the screw spring. When you have tightened the screw spring you can let go of the threaded shaft. Now insert the blade of your flat head screwdriver between two coils of the spring close to the trolley stop. Use your wrench to tighten the nuts until you hear an audible pop from the spring. The belt is now adjusted correctly. Now all that remains is to reconnect the power supply and your DIY belt adjustment is complete. By simply performing this small inspection and adjustment task every now and again, you will ensure your belt drive garage door opener continues to give you quiet and trouble-free service. One important consideration when buying a new garage door is the material of which it will be constructed. Steel is one of the most commonly used materials for garage doors and has many advantages, with only a few drawbacks to speak of. 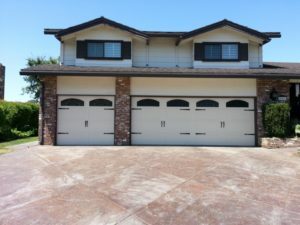 Here are four good reasons to consider steel for your new garage door along with a couple of things you might consider as disadvantages. While steel is very strong, it’s also malleable. This means a wide variety of finishes can be pressed into the door’s surface and there’s really no limit on the number of designs which can be produced. Color too, is limited only by your imagination. Steel doors can be bought in a variety of colors. If you prefer, you can customize your door by painting it yourself with any color you fancy. Steel is a very versatile material, which means any type of garage door can be constructed from it. Whether you decide upon a sectional door, roller door or traditional up-and-over style, you will be able to find one that’s made of steel. You can even buy side-hinged steel garage doors if you prefer that style. Steel is strong, which makes it secure. A steel garage door offers a high degree of protection to your home. It is resistant to break in attempts and can also hold its own in the most ferocious of storms. Blown debris in a hurricane, for example can do irreparable damage to wooden doors and sharp objects can punch right through fiberglass. Steel might suffer some dents but is likely to come through a bad storm in better shape than doors made of other materials. Although steel garage doors come in many colors, today they are all green. The beauty of steel is that when your door reaches the end of its useful life it can be recycled. In fact, many new garage doors are actually constructed from recycled steel. So if you are keen to consider the environment as part of your selection criteria, steel is one of the most sustainable options. As far as the drawbacks of a steel garage door are concerned, poor insulation properties probably represent the one which should concern you most. However it’s not an insurmountable problem. If you have the budget, you can buy an insulated steel door or you can always insulate it yourself after it’s been installed. The other possible disadvantage is that you will need to apply a new coat of paint to your steel door every now and again. However, while this entails a little effort, it’s also an opportunity to brighten up your door and ring the changes with a new color. With far more pros than cons, it’s little wonder that so many people have steel garage doors protecting their vehicles and homes. Whether you decide upon steel or not, hopefully the information above will help you to make an informed choice.